Down to Bedrock for a little prehistoric jazz with Fred and Wilma… A fairly slow tempo and very few speedy runs puts this transcription within reach of a lot of players. Believe it or not, this lesson continues our look at rhythm changes, which we’ve been covering for the past couple of articles. In those articles, we ‘saw how the chord arrangement to Gershwin’s I Got Rhythm has become a jazz staple and how many other tunes share its basic harmonic point of view. In order to illustrate this fact to its fullest extent, we came up with what is possibly the least likely contender for jazz treatment, the theme to The Flintstones. Yes, Fred and Wilma’s signature tune shares its chord arrangement with I Got Rhythm – there’s a fact you can bring up at your next dinner party! My recording is not without precedent; Herb Ellis played this tune quite a lot and even recorded it. In order to counter the saying, ‘Jazz means never having to play the melody’, I’ve stuck pretty close to the tune all the way through. This is a vital thing to acknowledge as you explore the sometimes crazy terrain of jazz music. The melody is the most important thing about a song -something a lot of jazz vocalists seem to forget -and learning to play it is a very important first step. If you really know how a tune sits on your fretboard, then you can improvise more efficiently. This is even more important if you are yet to become a sure-footed jazz improviser because you will always have the melody there as a kind of ‘handrail’ to guide you through the changes. It’s important from an audience point of view, too: the melody is their major reference point – stray too far from it and your audience will quite likely not thank you for it. You can use a few other tricks when playing a straight melody line. Listen to how I’ve ‘held back’ the melody rhythmically every so often – it sounds like I’m playing behind the beat and this gives the tune a lazy feel which is suited to some songs at slower tempos. Another thing I’ve done is play the first verse in a reasonably low register and moved up an octave to play at the end. This simple device is amazingly effective and can help freshen up a tune considerably. But, all simple devices apart, how do you go about turning a melody into something that resembles jazz? You’ll probably agree that The Flintstones theme is not particularly jazzy in content to begin with, despite it sharing the chord arrangement of a lot of jazz classics. I believe it all comes back to learning to vary the melody to begin with. Played at this tempo, the melody has a lot of gaps in it where nothing is happening and these are the ideal spaces to fill with a couple of ideas of your own. Start off by playing a couple of notes which you know are in the melody already in these spaces – even a random selection should sound okay. But we don’t want to keep this as a ‘shot in the dark’ process – that’s not how the trick works at all. You have to learn to hear which notes you want to play and find them on the fretboard instantaneously. If this sounds like a seemingly impossible task, I can assure you that it sounds impossible to everyone at first, so don’t give up. Once you have successfully played a couple of melody notes in the melodic gaps, it might be time to explore some chromatic tones. This gives everything its jazz sound, but it needs to be used with caution at first. There’s nothing worse than a bad note in a good place and so a considerable amount of trial and error is going to have to take place while you practice before you begin getting the trick right every time. If two notes in the melody are a tone (three inclusive frets) apart, see what they sound like with that middle note filled in. Try to arrange it so that you play the weaker chromatic tone on an offbeat if possible. The important notes need to be on the important beats of the bar. I’ve said many times before that I would rather teach a method where students are encouraged to use their ears from the word go, rather than build up a vocabulary of relative chords and spend all their time applying a mathematical formula while they play. Experiment with patience – you’re bound to be rewarded. This is a pretty extensive musical term glossary here for you guys, don’t forget about it. 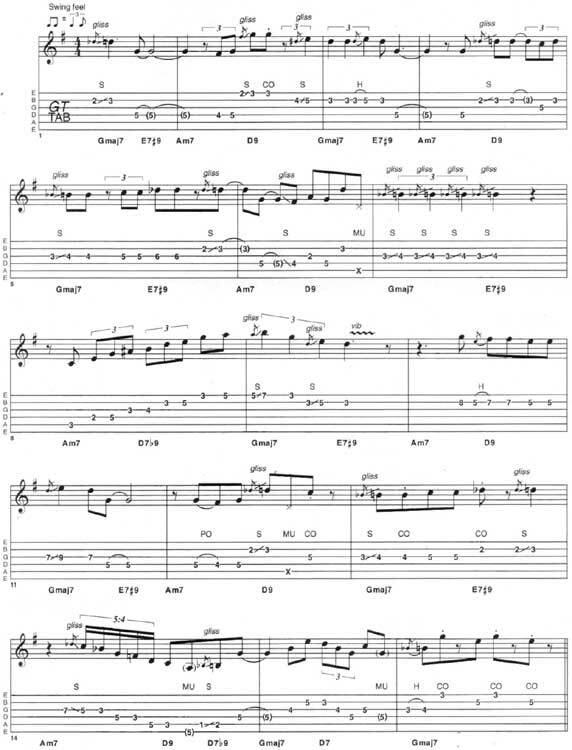 It’s a part of Flintstones Theme guitar tab and sheet.